With over 30 years of experience in data conversion projects, businesses across the country have trusted File Label Express with their data retrieval and cleanup projects. Our team specializes in unlocking important data from un-supported systems. We can convert nearly any type of data from an old legacy system to a forward compatible and managed solution that will run on any PC, laptop or mobile device. We can convert text based documents to a durable PDF archive and index them into File Label Express. Our top notch staff of software and database developers can help you crack even the most dated of data. When it comes to shared drives, we can secure vital information and enable full text search in the process, with standard indexing that is fully compliant, secure and accessible to only those users authorized to see it. Our services include a plan to integrate such data into an advancing plan for comprehensive and compliant data tracking. 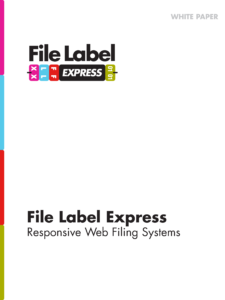 File Label Express is built upon a commitment to doing it once and doing it right. Our team of records management professionals has designed and developed unique solutions for efficiently managing records. We aim to provide businesses of all sizes with high-quality, cost-effective filing solutions. We offer a simple value proposition: to capture your work, your effort, and your file metadata as you are originating it, and use it again and again to advance your business interest in the records you create and maintain. We’re built upon a commitment to doing it once and doing it right. It’s quite simple, you are doing this already, simply do it better, simply do it once, and do it right. Let us show you how.